The picture of Canadian Prime Minister Justin Trudeau has gone viral multiple times. But it’s unlikely that is ever appeared on a truck, in Pakistan or elsewhere. Portraits of politicians, generals, and sports stars are not unusual on Pakistani trucks. They’re almost always found on the rear of the vehicle, where there’s the most space available and usually less religious imagery. Its not common, but not unheard of, to see non-Pakistanis featured. During the first Gulf War, Saddam Hussein was a popular subject, as was Princess Diana following her death. Trudeau is good looking, young, and soft-spoken. In many respects, he’s the opposite of Trump. Although there’s a large Pakistani population in Canada and Trudeau has made efforts at outreach, he’s far from the most prominent world leader. That he’s not the most likely person to be featured on a Pakistani truck makes the painting all the more noteworthy. This picture has gone viral and replicated thousands of times, but there’s no evidence that it ever appeared on a truck. I’ve been told that it was commissioned specifically to hang as a picture, not on a vehicle. 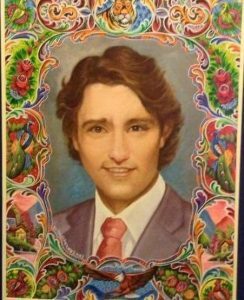 While its a beautiful piece, the picture of Trudeau never appeared on a truck. It was first posted by a Twitter user @jawadhq13 on January 28, 2016. It was widely circulated, even making its way to a Pakistan Day reception hosted by the High Commission in Canada in March of that year. About a year later, it suddenly generated more attention, including coverage by French media, several Pakistani outlets that apparently missed it in 2016, and even Russia Today. All media used the same image in their reporting. Hopefully Trudeau in truck art will spark media attention again, with another image, on an actual truck.